One of the most often asked questions the librarians hear is, “Can you help me find this article”? The student has a citation and is seeking access to the complete article. The library has a tool labeled “Find online journals by title” that will allow the user to locate full-text journals in the UDM databases. Here is how it works. Let’s say you have the following citation and you’re looking for the full-text of the article. Ashkin, Evan, and Anne Mounsey. “A spoonful of honey helps a coughing child sleep.” Journal of Family Practice. 62.3 (2013): 145-147. Sep. 2013. From the library homepage, research.udmercy.edu, select the third tab, Articles, Journals + Databases. About half way down the page you’ll see “Find online journals by title”. Enter the name of the journal in that search box. For this example, the name of the journal is Journal of Family Practice. Click on Search. 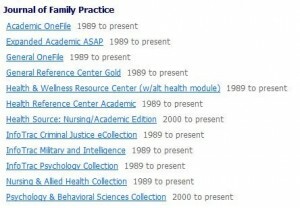 We can see that the Journal of Family Practice is in multiple databases from 1989 to the present. The next step is to select one of the databases. Then, locate the year in which the article you are looking for was published, in this example, 2013. Then locate the volume and the issue. In this example, volume 62, issue 3. Click on that volume/issue then scroll down until you find the article. Click on the PDF link to open it up. Welcome back! It’s a new term and the library is at your service. Come see what we have to offer. Find materials for your research needs. Discover the thousands of electronic books accessible right from your computer – you don’t even have to come to the library to use them (though we would be happy to see you)! We also have databases for searching scholarly articles. Need to use a computer? We have over 50 and you can even print too. Explore our vast collection of audiobooks or choose from an array of music. Looking for a movie or two to watch (hopefully not during class)? We have an extensive collection of DVD’s. We have earbuds, scantrons, and flashdrives available for cheap. Make your paper look professional with our spiral binding system. Stop by the Simply To Go Cafe to grab a coffee or a bite to eat. Then find a place to study or hangout with your friends. And last but certainly not least, the librarians are available to help you 24 hours a day either in person or online. See you soon! Happy New Year from the librarians! Are you refreshed and ready to tackle another term? The library re-opens tomorrow, January 2, 2014 at 9:00am. 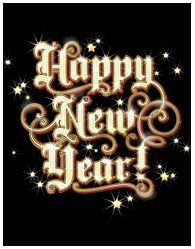 What’s new for the new year at the library? - Have you heard of LibGuides? Maybe not, but you’ve probably seen them. 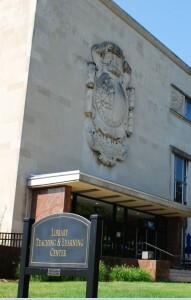 LibGuides organizes information on a web site. Coming soon, you’ll have access to discipline-specific information in the form of a Libguide. Check out a preview of the Nursing LibGuide by clicking on this link. - Filed under everything old is new again, the Statistical Abstract of the United States has been published by the federal government since 1878. It is a comprehensive, authoritative collection of statistics on the social, political, and economic conditions of the United States loaded with census information and tables of data. In 2011, the government decided to stop publishing it. Fortunately, ProQuest has brought it back both in print and online. Take a look by clicking on this link. -You heard it here first. One of our previous blogs described a new database called Nursing Education in Video. Nursing Education in Video is a unique online collection of videos created specifically for the education and training of nurses, nursing assistants, and other healthcare workers. Coming this January, this database will have a whole new look. We will be purchasing this database from a new provider, MedCom-Trainex. It will have all the same videos we have now plus more current content. Our new subscription will be in place just in time for the start of the winter term. That’s just the tip of the iceberg. Stay tuned to this blog for more research news in the coming year. Congratulations! You finished the fall term! All the homework assignments, the papers, the quizzes and the tests (not to mention the anxiety) are all behind you for this academic term. Now it’s just a question of finding out what your grades are. Give yourself a pat on the back! Relax and enjoy the holidays and we will see you right back here at the From the Research Desk blog with more tips and tools to help you accomplish your academic goals for the Winter term. How many times have you heard “there’s two sides to every story”? With the popularity of social media sites like Twitter and Facebook, it seems everyone has an opinion about everything these days. So where can you go to get intelligent information about controversial topics? Try the database Opposing Viewpoints: In Context. This database covers the pro and con perspectives on over 13,000 issues from the legalization of marijuana to rap music to Wikileaks. In addition to the pro/con arguments, Opposing Viewpoints has information on current events and special topics and contains interactive maps of statistical data. By using the advanced search option, searches can be limited to full text documents and peer reviewed journals. 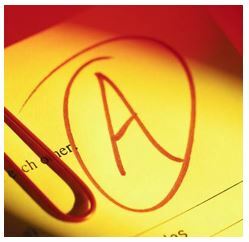 Results are returned in such formats as news, audio, images, video, magazine, reference, academic journals or websites. You can search for over 100 document types from biographical information to market share reports to treaty information. You can even access primary sources such as speeches, interviews and transcripts. To access Opposing Viewpoints:In Context, go to the library portal page, research.udmercy.edu . Click on the third tab, Article, Journals + Databases. Under Find databases by title, select the letter O. Opposing Viewpoints is the second database. Click into it and enter into a world of controversy! I know what you’re thinking. It’s grueling, tedious and time-consuming. I’m referring to typing research papers and getting the in-text citations right and then typing that bibliography at the end with all that confusing formatting. Well, not anymore. UDM Libraries has a tool that makes the formatting of your citations oh so easy and its called RefWorks. Over the next three weeks, this blog will describe just how powerful a tool RefWorks can be when you are doing a research paper. It begins with opening an account. Go to the library portal page research.udmercy.edu. Click on the third tab, Articles, Journals + Databases. Under Find databases by title, you will see the alphabet listed. Select the letter R. RefWorks is second on the list. Click into it and click . As you do your research and find articles in the library databases, use the export feature found in most databases to load the citations into your RefWorks account. It is also possible to attach the articles to the citations in RefWorks (more on that next week). When you have completed your research, make sure all the citations of the articles you will be using in your paper have been loaded into RefWorks. When you are ready to begin typing your paper, go into your RefWorks account, click on Tools and download Write-N-Cite 4. Upon successful completion of the download, you should see this at the top of the screen in Microsoft Word. Click on Log In and enter your RefWorks account and password. You will also enter UDM’s Group Code, which you can obtain from the research desk. Have you searched for a book in the library catalog and seen this? The title field says electronic source, the location is UDM Electronic Resources, the shelving location is UDM electronic book, the call number ends with eb, and the status is Available online. What does it all mean? It means that this book is not in the UDM collection in print and does not sit on a shelf. No ink, no paper. It is an ebook or electronic book. Most of the time, an ebook is a digitized version of a print book. The appearance and content are the same. By clicking on , the book will open up on your computer screen. You can read it page by page, or navigate through by chapter. You can do a keyword search if you are only looking for a specific term. You can highlight text and take notes as you go. No Kindle, no Nook or any other specialized e-reading device is required. This may come as a surprise, but no library has every book or every journal. But there is a method in place for obtaining a desired item when your library doesn’t have it. It’s called Interlibrary Loan (ILL). By using ILL, you can request a book or a journal article that the UDM library doesn’t have and our staff will obtain it from another library. So how does it work? It’s simple. From the library portal page, click on the tab Books, Ebooks, +DVDs. You will see a brown button labeled Interlibrary Loan. Click on that and an electronic form will pop up. The form has two parts: one part is for your information and one part identifies the item you are interested in obtaining. Complete both parts of the form and submit your request. We take it from there. If you are requesting a book, our Interlibrary Loan Technician will research which library has the item you want and will request to have it sent here to UDM. You will be notified by email when it arrives and you will be able to check it out. The lending institution will determine how long you can borrow the book. When you are finished with the book, just return it to the UDM library and we will send it back to the lending institution. If you’re request is for an article from a journal UDM does not have access to either in print or electronically, again our Interlibrary Loan Technician will obtain the article from another institution. You will receive an email notification when it arrives and you will be able to pick it up in the library. There are materials libraries will typically not send through ILL such as rare books, textbooks, and audio-visual materials. For more information about Interlibrary Loan, check out the UDM Interlibrary Loan information page. Sometimes you may search in the UDM catalog and see a record that indicates the item you want is shelved in the UDM Michigan Core Collection in the Conference Room. The Michigan Core Collection consists of nearly 1,780 items dating back to the 1800′s on various topics all of which concern the State of Michigan or Detroit and its surrounding neighborhoods and suburbs. Do you have an assignment on a particular Detroit landmark such as the old Hudson’s building? The Michigan Core Collection has books on it. Need a book on the history of the auto industry? The Michigan Core Collection has it. How about the art and architecture of Detroit? Look no further than the Michigan Core Collection. 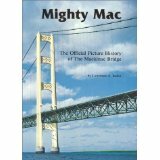 The Michigan Core Collection is a rich source for all things Michigan from waterways to old census records, from the lumber industry to lighthouses.